Last edited by Geborgenheit; 02-10-2019 at 12:51 AM. Interesting, I also score Peloponnese, Thessaly and Central Greece for some reason as Likely Match, you don't have connections from there I suppose. I got Ionian Islands as well (lol). Btw I got Grabovo and Haskovo Bulgarian provinces... what are yours? Have been trying to figure out my Greek connection(s).Some of my Greek matches have GF from places where no Bulgarians were present.I'd expect Central Macedonia and Thrace to have the strongest signal...acc.to 23andme,they come last,weird. I was assigned Burgas (v4) and Burgas and Plovdiv (Ancestry upload) . No complaints here. Last edited by td120; 02-18-2019 at 10:07 AM. 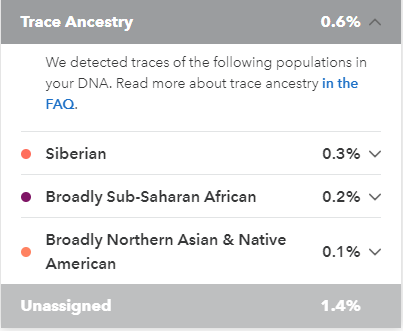 A lot of <1% ancestry has been moved to "trace regions" on the composition. In some ways, perhaps understandable given that many <1% results turn out to be noise. Sadly, my Broadly Southern Euro, which I know to be real and possibly with a Sephardic component, is there. There should be a way to mark it as "not noise" so it shows up in the main composition. Urgh why use that old k15 jpg when ph2ter has a proper pca plot available? For reference, my latest paper trail within the last 200 years is: ~ 28.125% Irish, 25.0% English, 21.875% French, 12.75% Ukrainian, and 12.75% Romanian. - The Jan. update to Ancestry Composition removed the erroneous Sardinian and Jewish ancestry bits. - The update and the phasing cut my 26.3% "Broadly NW Euro" in half to 13.8%, and cut my "Broadly European" in half from 10% to 5%. 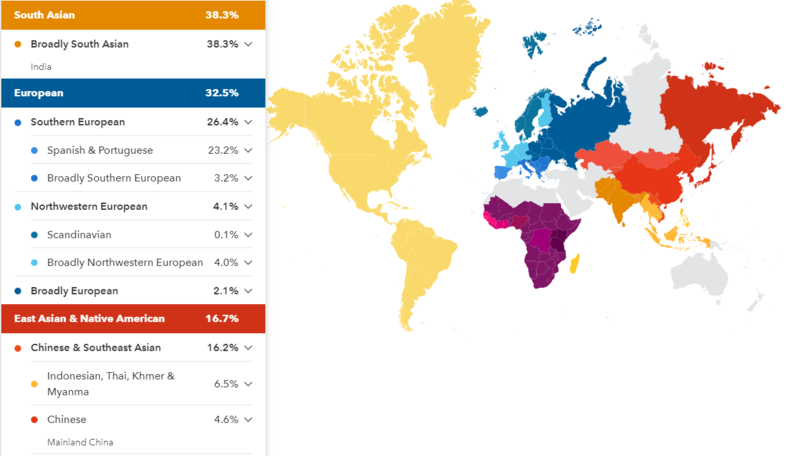 - After phasing with both parents I find a new trace of Italian at 0.4%. 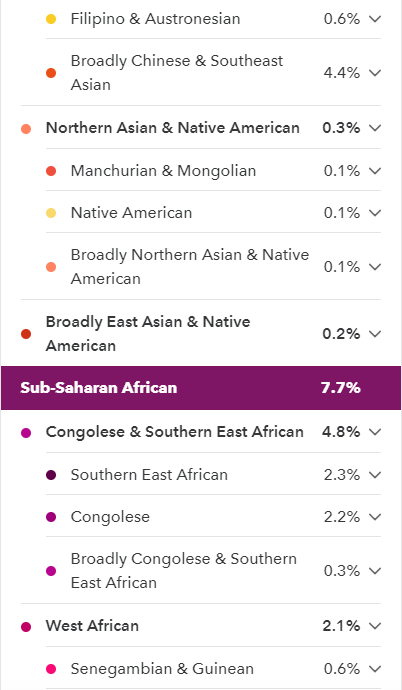 - While phasing did remove my "Broadly Northern Asian & NA", my East Asian/NA and African traces remained constant at 0.3% and 0.1%. 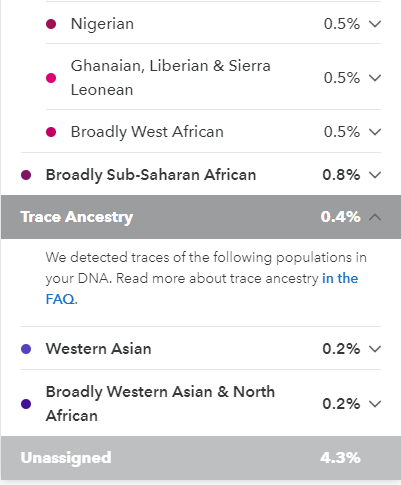 Again, barring any other evidence I treat these as random variance (aka noise) as I have no known African or NA ancestry in the last 350 years. - Finally a look at the chromosome paintings of mum and dad shows me that my 1.4% Spanish & Portuguese, 0.4% Italian, and 0.1% African and 0.1% Siberian are all completely absent in either of my parents. Therefore I conclude that the uncertainty for the 23andme test is at least +/-1.4%. My next test will be when 23andme upgrades my V4 test to the V5 chip which both of my parents are on. In a message from Customer Service, they promise they are going to release an upgrade option in April or so that will be substantially cheaper than retesting on V5. Stay tuned. I heard some kits on v4 have been updated yesterday and today. Any luck for some of you?